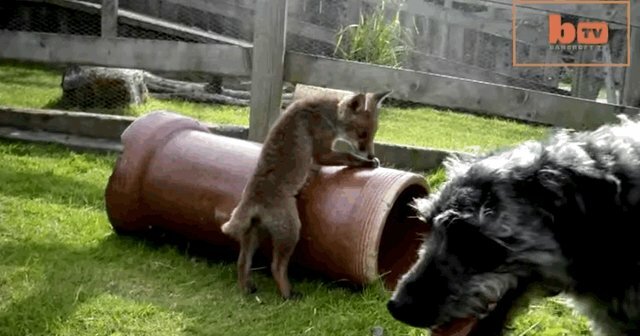 These real-life versions of "The Fox and The Hound" seem to have found perfect playmates in one another. The little fox (now named Forrest) was found abandoned and malnourished in a puddle, with part of his tail missing, at just four-weeks-old. Gary Zammit, a wildlife ranger at Feadon Farm in Cornwall, took in the orphaned little kit. The fox became fast friends with Gary's dog Barney -- who is also missing part of his tail! The tail-less duo's friendship has continued to grow, and the two love to spend hours playing together. As Gary told Daily Mail, "It really was love at first sight with them both. Barney is so gentle with him and they play for hours and hours... even without tails to wag you can tell they are happiest when they are together." You can also check out another adorable fox and hound friendship here!